A springtime river cruise through the Netherlands and Belgium offers just enough time to smell the flowers along the way. This is the second of a two-part blog post. This post describes the cities and towns we visited on a Tulip Time Cruise with AmaWaterways. A companion post The case for riverboat cruising on AmaWaterways (Part 1) discusses the advantages of river cruising and our onboard experience on AmaSonata. Admittedly, although we’ve enjoyed river cruising in the past we were a bit ambivalent about committing to the AmaWaterways Tulip Time Cruise to the Netherlands and Belgium, scheduled to depart from and return to Amsterdam. Was it really such a big deal to see tulips when you live a stone’s throw away from the New York Botanical Garden? Why leave the East Coast during one of the most beautiful times of year? Were we wrong! It was amazing to visit the Keukenhof Gardens with more than a thousand different varieties of tulips and hyacinths in bloom and to see the colorful tulip farms dotting the landscape. 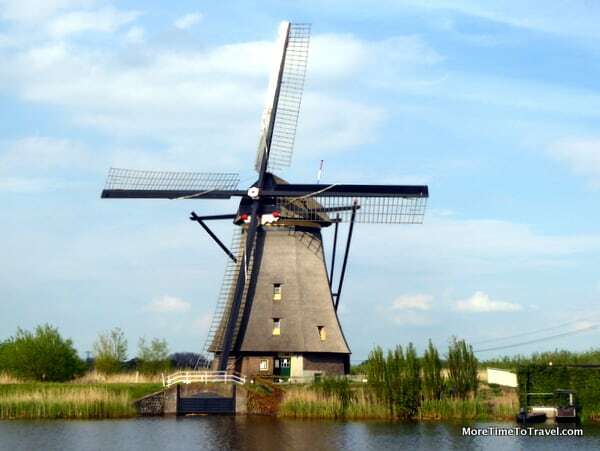 But beyond flowers, windmills and wooden shoes, our 8-day, 7-night springtime cruise through the Netherlands & Belgium allowed us to experience and learn about the foods and culture of the Dutch and Flemish people living along the inland waterways that wind through midwestern Europe. In Amsterdam, our ship was conveniently docked on a pier in the heart of the city near Amsterdam Central Train Station. Before our ship left the port, we were able to unpack, get settled, and tour Amsterdam (often called the Venice of the North) on a private cruise through its historic canals learning about the magnificent canal houses from the Dutch Golden Age that line the shores. We also took a panoramic bus and walking tour that introduced us to some of the city’s highlights, including Dam Square, Begijnhof, and the Royal Palace. There was even some free time (albeit limited) to explore the city independently or visit one of its world-famous museums (including the Rijksmusem, the Anne Frank House, and Van Gogh Museum). Although the terms Holland and the Netherlands are often used interchangeably, “Holland” actually refers to the region on Netherland’s west coast where we were able to visit two smaller cities, Hoorn (once a powerful marine town) and Edam (a whaling town known best for its cheese). In cities like this, local guides were able to tell us about places they knew intimately. Our bus trip there took us past expansive fields filled with tulips planted in bands of color. When the boat docked for visits to the Arnhem Airborne Museum in Arnhem (known for its role in Operation Market Garden during World War II), we decided to catch up on sleep and do some writing before our afternoon tour of Nijmegen, founded by the Roman’s in the second century. This town has the distinction of being one of the few Dutch towns built on hills. After a few rainy days, the sun was brilliant and weather picture-perfect as we walked through this historic center with its restored 15th century Weigh Station (The Waag) used to weigh various goods, the large university and its commercial center, which seemed like an epicenter for black licorice and herring. Antwerp was our decadent gastronomic introduction to Belgium where we took an “optional” but reasonably priced, experiential walking tour to learn about/savor Belgian chocolate, waffles and beer in the shops fanning out from the city center and Great Market Square. This was another city where active cyclists could get to see Belgium’s second largest city and its historical sites up close. (Belgium is one of the ten countries in the world with the most cyclists per capita; The Netherlands is number one). Our bus and walking tour in Brussels, Belgium’s largest city and headquarters of the European Union, allowed us to see its spectacular Grand-Place, the central square that houses Brussels City Hall, the city museum, and the opulent Guildhalls. With gothic and baroque architecture adorned in paint and gold leaf, it’s not surprising that this square was voted the most beautiful in Europe in 2010. We had enough time to wander through the nearby streets (with and without our local guide); visit the city’s most famous sculpture, Manneken Pis; pass through the Galeries Royales Saint-Hubert; and rest our feet at Maison Dandoy in our pursuit to find the best waffles in Belgium. Where would we want to live if we moved to Belgium? We were smitten with Bruges, a well-preserved town that looked like it came out of a fairytale. We walked through the cobblestone streets filled with medieval buildings, stately churches and shops. Even the rain didn’t daunt us from taking a scenic canal boat cruise to see the magnificent buildings and spot the Belfry Tower, said to be the finest in Belgium. To dry off, we wandered into a cozy but spectacular restaurant, De Koetse, for a memorable lunch of mussels and lamb. On our way back to the bus, our guide showed us the city’s well-preserved Beguines (semi-monastic religious communities), one of many set up for widowed women throughout Europe during the Reformation. Willemstad, surrounded by a city wall in the shape of a seven-pointed star, was, perhaps, one of the most picturesque of the villages we visited. We decided to visit it on our own (although we could have taken an escorted tour), encountering very few other wanderers, even locals. We stopped at a small bakery with enticing smells wafting into the street and took pictures of a windmill that had been converted into a home and garden. This was the perfect place for cyclists to take advantage of the flat, uncrowded roads. One exceptional thrill of our trip was passing through fields of yellow rapeseed on our way to see the 19 iconic windmills at pastoral Kinderdijk. Listed as a UNESCO World Heritage Site, these windmills are playfully dubbed the “first skyscrapers of Europe.” Our local guide, Petra, knew the millers and families that still live in these windmills and shared their stories. She also explained the importance of the windmills in water management (much of the Netherlands is below sea level). We wound our way up creaky stairs to the top of one of the windmills open to visitors and could see how wooden clogs might be helpful to someone working in these low-lying wetlands. Petra told us there is a 15-year waiting list for lodging in one of these windmills; the millers have full-time jobs and moonlight tending the mills, which require them turning the blades 10,000 times per year. Our last cruising day before returning to Amsterdam allowed us the experience of visiting 70-acre Keukenhof Gardens in Lisse, the largest bulb flower park in the world, that is only open two months a year. No words can describe the beauty of this living museum that attracts more than 14,000 visitors per day. We learned about the Dutch history of “tulip mania,” speculative trading of bulbs that, at one point, increased their price to more than that of a home, followed by a terrible wave of bankruptcy that rippled through the country. After an orientation, our guide allowed us to roam freely to explore the gardens and pavilions. The 2015 theme of the park was Van Gogh. It was remarkable to see the painter’s self-portrait in a mosaic comprised of tens of thousands of tulips. Our return to Amsterdam came far too soon. We were glad to have one more afternoon before our last night on board to walk through the city and purchase some stroopwafels (a characteristic cookie made of two crisp waffles with a creamy caramel or honey center) and some Gouda and Edam cheeses to take home. While reluctant at first, we fell in love with this new-to-us part of Europe and can’t imagine a better way to visit it than by cruising along its shimmering rivers and canals on AmaWaterways. We were also totally amazed at how much we got to see and do in one short week. Prices start from $2499 per person, double occupancy. Tulip season, from mid-March to the end of May, is time-limited and subject to the unpredictable weather common to the area. This year (2015) AmaWaterways offered 15 departures on three of its ships between March 23 and May 6th. Amsterdam is a great port from which to start a river cruise, not only for its access to waterways but also because of its proximity (about 20 minutes) to Amsterdam Airport Schiphol. The fifth busiest airport in Europe, Schiphol offers international connections to many cities around the world and for us, was a direct flight from JFK in New York City. Arrive in Amsterdam a few days before your cruise. Not only will it give you the time to adjust to jet lag, but also the opportunity to visit this magnificent city rich in history and culture. Alternatively, you can plan to spend time in the city post-cruise. If you haven’t done a lot of walking in the weeks preceding the cruise, it’s helpful to start “training” by walking at least a few miles a day at home. Passengers ran the gamut from very active to those less so. More active cruisers were able to make use of complimentary bikes stowed on the boat; the cruise line staff (and tour operators) were also respectful of “gentle walkers” who were able to walk at their own pace in a separate group. Disclosure: Our cruise was hosted by AmaWaterways but any opinions expressed in this post are our own. This post is part of a LinkUp to Budget Travelers Sandbox. A magical getaway of worry-free getaway fun. Holland and Belgium are so beautiful and the shore excursions AmaWaterways plans for its passengers are exceptional! Wonderful you got to see Bruges on this trip! Friends picked it as a place to stay for over a week – for the chocolates, beer and bicycling – and loved it. It’s on our travel wishlist :-). By the way, did you use the free bikes onboard? To go off and cycle on your own for a bit sounds like fun (if the village/countryside is bike-friendly). Not on this trip; I’m embarrassed to see we didn’t have the time! Your river cruise sounds wonderful. You managed to see a lot in the Netherlands and Belgium. I found the story of the windmill residents particularly interesting. Even since I saw the movie “In Bruges”, I thought the city would be an interesting place to visit. Thanks for reminding me, Donna. I’m going to add that movie to my Netflix queue! I visited most of these places back in the ’80s and your photos bring back fond memories of the people I met, delicious foods I tried for the first time, and the gorgeous flowers at the Keukenhof Gardens! Wanderlust is setting in, I need to get back to the Netherlands and Belgium. This looks like a wonderful cruise and I love all the other side trips that you also took Irene. The AmaWaterways Tulip Time Cruise sounds fabulous. I had no idea it included so many interesting stops beyond tuliptime. I once visited at this time of year and had a great tour just on land, but I like the added dimension of visiting so many other cities as well. We nearly did a river cruise last year, then opted for a coach tour as we felt we’d be able to explore more. But you’ve hooked me in! Yes, agree Amsterdam is a great place to start and like most tours in Europe you do need to be as fit as possible to get the most out of them as there are always steps to climb, mountains to get up and cobbled streets to navigate. I love that the boat had bikes stowed. We would have enjoyed that too. Having one home base on the boat seems like a real advantage over a bus tour—also being able to travel distances during the night. Love it! How expensive was it? Love it…no need to pack/unpack. That’s why we love RV cruising! The “mostly” inclusive prices start at $2499 per person, double occupancy, Carol. We did a similar trip with Viking and loved it. Didn’t get to as many places in Belgium though. What an amazing cruise. Each day looks like it brought something wonderful to experience and a feast for all the senses. I love the gabled roofs, the rustic windmills outlined against the blue sky and the colorful tulip gardens of Keukenhof. This is my idea of paradise but I also loved your quest for chocolates, waffles and beer! So many of the towns and cities we visited on this cruise looked like they could be backdrops for fairytales. Belgian Chocolate is the BEST!!! Belgium has a wide array of GREAT beer, did you try any???? Didn’t anyone tell you that Belgium makes the best ‘french fries’ in the world? But it sounds like the trip was a wonderful experience and the colourful photos are just exquisite. Our German exchange student, 2 years ago, ate them like that too. Did you like it? I’m strictly a ketchup girl…but Belgians (and I guess some Germans) prefer mayo! I’m a mayonnaise convert – married to a German for over 20 years – I actually prefer it. Love the stops on your AMA Waterway cruise. Bruges is one of my faves had the best ever chocolate and fries there. Loved all the gorgeous flowers too – looks like a lot of fun. Next time you hesitate to accept such a wonderful itinerary please send it on to me! My sister and I have always wanted to see the tulips and windmills and to do some in combo with a river cruise sounds and looks fabulous. I was only in Brussels once and my memory of it is that I liked it because it had a lot of handsome men walking around wearing suits (I have very deep values)! This post really makes me want to get this on next year’s to-do list. What a calm and peaceful way to take in these wonderful cities and sights! I would just LOVE to float by fields of tulips! Personally I’ve always preferred Belgium to the Netherlands (although it’s good you got to see both). I love the old towns like Antwerp and the food is pretty good too, especially the chocolate! We’ve been to some of those places but not on a cruise. It does sound like a fun way, through the waterways. Ahh! Amsterdam, you captured it so well. The cruise sounds like a great idea. We ate the same herring on the street with the flag! I did not care for it, but I was a trooper and tried it. Your photos are spectacular!